The formula for weight loss should be simple: cut back on calories, increase the amount you exercise, and the pounds should fly-and stay-off. But it's not always that simple, and we've learned that even the most successful dieters end up gaining the weight back-and then some-80% of the time. Thanks to a growing movement that focuses on healthy lifestyle tweaks rather than the latest fad or extreme diets, there's more than one approach to losing weight, and keeping it off. 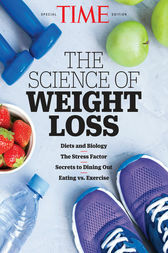 The Science of Weight Loss, the new special edition from editors of TIME, shares the latest insights from industry leaders to help you put your health and wellness plan into action. Along the way you'll learn the benefits of intermittent fasting, clean living, and secrets from Hollywood's top trainers. Did somebody say wine? Studies have shown that those who drank moderately gained less weight over time than those who never imbibed at all. And you'll be delighted to find that you don't need to adopt the lifestyle of a marathon runner-a brisk walk happens to be hugely effective for weight loss! Whether you're preparing for summer, maintaining that New Year's resolution, or simply looking to ease some stress, The Science of Weight Loss provides the latest findings that will help you live your best life, today.